Airds Moss is the extensive moorland that stretches north-east of Cumnock towards Muirkirk. Most of it lies within the parish of Auchinleck, including the site of the battle and monument. 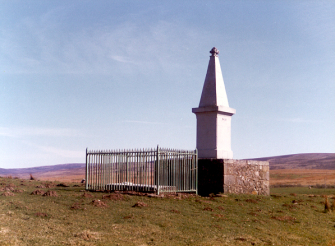 On Airds Moss stands a squat obelisk and a flat gravestone within railings. The gravestone was placed there by the SCMA to replace an older stone that was illegibale and damaged. Click here to read more about new stone. The stone was made to replicate the original stone and inscription, and incorporates the Bible and crossed swords that are mentioned in the poem A Cameronian's Dream. Details of the replacement stone can be found here. Here lies the corpse of that famous and faithful preacher of the Gospel, the Rev. Richard Cameron, with the corpses of several others, who were conquered by the bloody enemies of Truth and Righteousness. Our souls triumph with Christ our Glorious Head. To witness 'gainst this nation's perjury. On the adjoining obelisk, erected in 1837, are the names of those who were killed here. The old gravestone has been removed from the site but survives. Among the manuscripts in the possession of the Reformed Presbyterian Synod is the following letter of Sir Robert Hamilton to Robert Smith (at that time a prominent member of the Societies), in which an account of the erection of the stone is given, and the original epitaph is subjoined. The letter, by its date, March 4th, 1702, confirms the statement made in the memorial presented to the Edinburgh Town Council for permission to erect a stone in Greyfriars, that monuments had already been erected in "other places of the nation." "MY DEAR BILLIE,-I am glad of an opportunity either to hear from you or you from me. The stone is curiously wrought on our Lord's servant at Airdsmoss, with a pleasant epitaph, the Bible open, a hand, arm and shabble; and another stone ready for laying on them [i.e., the martyrs]; I hope to the satisfaction of friends. The gentlemen in that country offering to lead lime and stone for the building a tomb wall about them, if we will be at the pains to build it and our stone. 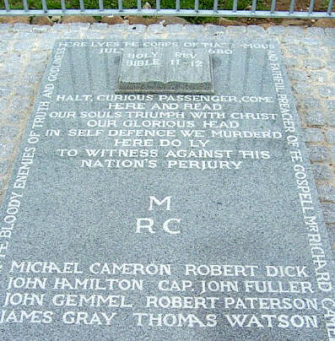 A small battle between the Covenanters under Rev Richard Cameron and the government soldiers under Sir Andrew Bruce of Earlshall took place on 22 July 1680. Richard Cameron was no common man. Born in a house which is still standing in the quiet little town of Falkland, Fife, he had been brought up as an Episcopalian. On careful consideration, however, he cast in his lot with the persecuted Covenanters. And he did this in no half-hearted fashion. His was one of those minds which saw truth so clearly that compromise was impossible. He had no patience with the Indulgence. To accept of that was, in his eyes, not weakness, but sin. He therefore kept himself at the head of the "Irreconcilables," and by his genius and decision, gave his name latterly to the whole party. Listen to some of the words of this man, as he stood out there on the moor, preaching to the persecuted remnant that clave to him. "0! sad to think upon the West of Scotland," he cries, "the wild Highlands have not neglected so many calls as thou hast done. It may be ye think ye have enough, and stand in no need of persecuted Gospel ordinances. Yet, ye are the people in all Scotland that are in the worst condition. What say ye 1 Shall 1 go away and tell my Master that ye will not come unto Him? I take instruments before these hills and mountains around us, that I have offered Him unto you this day. Angels are wondering at the offer. They stand beholding with admiration that our Lord is giving you such an offer this day. Nay, those that have gone to hell many years ago, and who are now crying out in the agonies of torment, may be saying, "0, that we had such an offer as yonder parish of Auchinleck!" Look over to the Shawhead and all these hills. Look at them. They are all witnesses now, and when you are dying, they will come before your face." And then, both minister and congregation, as an eye-witness tells us, fell into a state of calm weeping. These men felt themselves for the time carried away from earth. They were in the spirit world. The hills about them seemed living creatures. All nature was bound over to appear as witness against them at the Great Day. They were no longer encompassed by this world's anxieties, but by the hopes and fears of their dying hour. But now the dying hour, with its hopes and fears, had come to Richard Cameron himself. The 22nd July, 1680, found him away up in this Muirkirk district, attended by sixty friends. The night before, he had slept at a shepherd's house, and said when washing his hands in the morning, " 1 must make them clean, because they must be seen by many witnesses." And now he was resting on this green spot about four o'clock in the afternoon, when a troop of one hundred and twenty horse, under the command of Bruce of Earlshall, were seen rapidly approaching. Escape was impossible, and so they resolved to sell their lives as dearly as they could. Cameron had but time for a few words of prayer, one petition of which he repeated thrice, " Lord, spare the green and take the ripe!" On concluding this prayer, he took his brother's hand for the last time, and said, " Now, let us fight it out to the last: for this is the day I have longed for, and the day I have prayed for, to die fighting against our Lord's avowed enemies?" The struggle was short but desperate. Cameron himself was killed in the thick of the fray, as well as his brother and seven others. Five, also, were sore wounded and taken prisoners (Hackston of Rathillet being leader), while the rest escaped over the moss, whither the cavalry could not pursue them. The prisoners were taken to Edinburgh, and there hanged. The head and hands of Cameron were cut off and taken to Edinburgh; and on delivering them up, the officer who carried them said, " There are the head and hands of a man who lived praying and preaching, and who died praying and fighting."